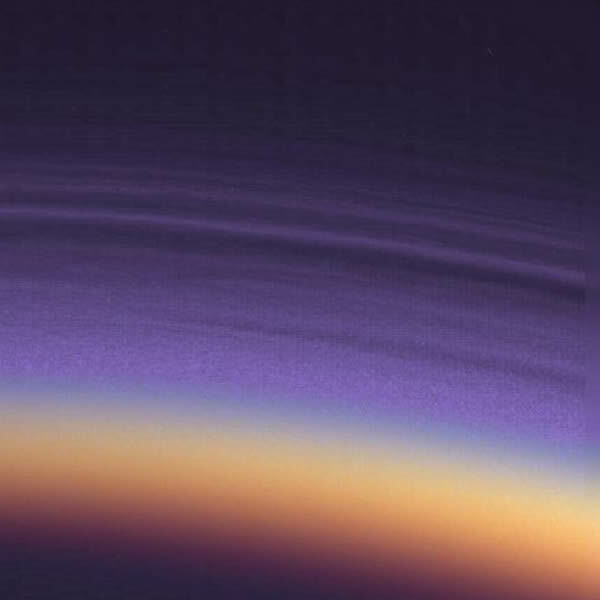 Titan provides [probably] the best documented example of a “fluorescing atmosphere” because of its rapidly changing atmospheric albedo [which is especially marked in the blue spectrum]. Disk-integrated blue (diamonds with dotted line) and yellow (crosses with dashed line) photometry obtained at Lowell observatory; dates are shown at the top. The advanced phase of the yellow data is apparent: both the peaks and the center crossings occur about 0.5 year before the corresponding events in blue. The observed 5% variation in Titan’s blue spectrum completely undermines any mainstream claims that the blue in Titan’s upper atmosphere is caused by scattering because the solar visible spectrum [400 to 700 nanometres] only varies by about 0.1%. Total solar output is now measured to vary (over the last three 11-year sunspot cycles) by approximately 0.1%, or about 1.3 Watts per square meter (W/m2) peak-to-trough from solar maximum to solar minimum during the 11-year sunspot cycle. 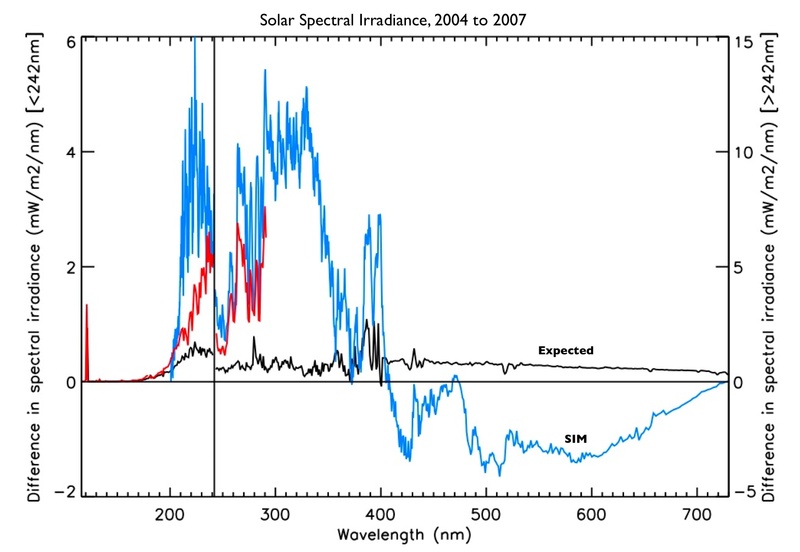 Between 2004 and 2007, the Solar Irradiance Monitor (blue line) measured a decrease in ultraviolet radiation (less than 400 nanometers) that was a factor of four to six larger than expected (black line). In the visible part of the spectrum (400 to 700 nanometers), SIM showed a slight increase in comparison to what was expected. Measurements (red) from another ultraviolet radiation-sensing instrument called SOLSTICE compare well with those from SIM. Note: different scales are used for values at wavelengths less and more than 242 nanometers (see left and right axes respectively). Credit: Joanna Haigh/Imperial College London. The variability of the solar ultraviolet spectrum has the potential to influence the fluorescence in Titan’s atmosphere by causing ionisation of the upper atmospheric particles. However, the variability of the solar ultraviolet radiation is discounted as the primary driver of Titan’s variable blue brightness because of its distance from the sun [Saturn – 9.58 AU] and because the solar sunspot cycle [of approximately 11 years] does not synchronise with Titan’s observed luminosity cycle of [about] 15 years. 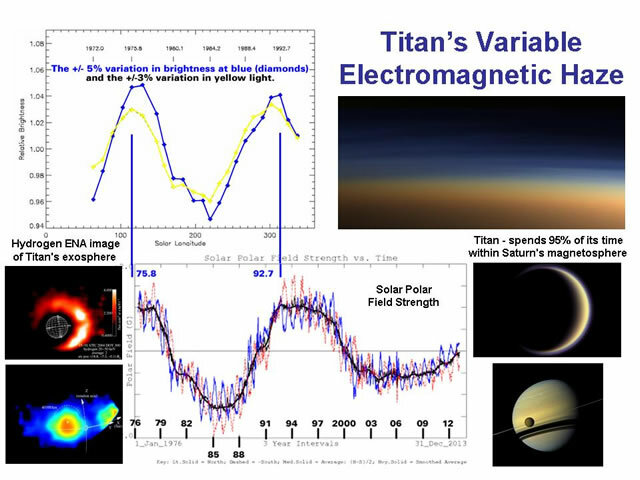 The second potential candidate for driving Titan’s variable fluorescence [of 5% in the blue spectrum] is the Solar Wind [via its charged particles]. Initially, this [again] appears unlikely because of the distance [9.58 AU], the lack of cyclical synchronisation with the sunspot cycle and because Titan orbit stays [predominately] within the protective domain of Saturn’s magnetosphere. Titan spends 95% of its time within Saturn’s magnetosphere, which may help shield Titan from the solar wind. The third potential candidate for driving Titan’s variable fluorescence [of 5% in the blue spectrum] is Saturn’s magnetosphere and this mechanism has been confirmed by the Cassini mission. 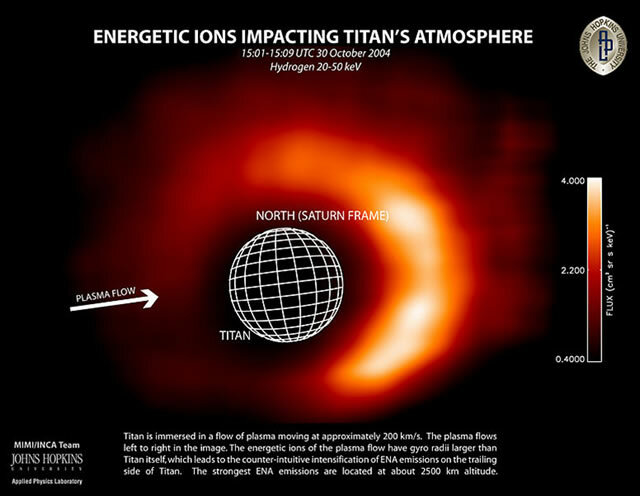 The energetic neutral atoms produced by the interaction of Titan’s exosphere with Saturn’s magnetosphere get almost completely absorbed below approximately 1000 km, where also the energetic ions from Saturn’s magnetosphere deposit their energy, ionize and drive ionospheric chemistry. Titan, immersed in the fast moving flow of plasma that surrounds Saturn, is shown with intensified ENA on its trailing side. The brightness cycle of Titan is driven by charged particles from Saturn’s magnetosphere. Additionally, the observed brightness cycle of Titan synchronises with the Sun’s magnetic cycle [the Hale Cycle of approximately 22 years]. The observed 6 month [in advance] offset in Titan’s yellow spectrum is indicative of the variability in electron energy levels. Lower levels of electron energy will drive lower wavelength photon emissions [red then yellow] and then move to higher wavelength photon emissions [blue then violet] as the electron energy increases. The violet, blue and red spectra would normally indicate exospheric Hydrogen and Helium. The yellow spectrum normally indicates a lower layer of exospheric Helium [although Helium is only a trace gas at the surface of Titan]. The conversion of electron energy into light [and heated gas particles] helps to explain the mystery of Saturn’s excess energy output [which I plan to followed up in another posting]. Saturn radiates more energy than it absorbs from the Sun. In fact, it emits 2.3 times more energy than it receives. Additionally, the observed synchronisation of Saturn with the Sun’s magnetic cycle provides an underlying [two-way] electromagnetic mechanism whereby a planet can influence the sun [and other planets] and vice versa. Gallery | This entry was posted in Astrophysics, Cosmic Rays, Electric Universe, Science, Solar System. Bookmark the permalink. All the planets and the star are powered by the filament. It moves them in a spiral, through space. Sadly, it grows in power. The solar 23 year cycle is AC. It is likely an harmonic of the filament.